Bradenton, Fla.(June 4, 2018) – Housing Trust Group (HTG), one of the nation’s largest developers of affordable housing, has closed on financing and broken ground on a new residential community in Bradenton offering both affordable and market-rate apartments for rent. An official groundbreaking ceremony was held today at 2 p.m. 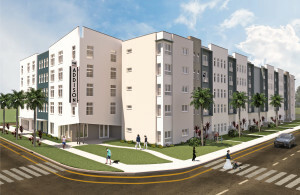 Located at 702 6th Ave E, Bradenton, The Addison will have 77 affordable apartments and 13 market-rate apartments, with monthly rents ranging from $328 to $1,400, depending on residents’ income. The property will be delivered in summer 2019. “Bradenton, like many communities throughout Florida, is suffering from a shortage of affordable and workforce housing,” said HTG President and CEO Matthew Rieger. “We’ve been working closely with the Mayor and City Council to develop a concept and plan that will provide residents with brand new, safe and clean affordable and workforce housing, with amenities and services that will enhance the overall community. The Addison was financed with a $15.5 million construction loan from Fifth Third Bank; approximately $14.57 million of 9% housing credit equity from Raymond James Tax Credit Funds; a $2 million State Apartment Incentive Loan (SAIL); a CDBG loan from the City of Bradenton; and a $5.125 million permanent loan from Freddie Mac originated by SunTrust Bank. The real estate transaction, which closed on May 18th, was brokered by Ben Bakker of MSC Commercial, a division of Michael Saunders & Company. The Addison will create approximately 100 construction jobs and five new permanent jobs. Located at 702 Sixth Avenue East, The Addison will consist of a mid-rise building with 25 one-bedroom apartments; 53 two-bedroom apartments; and 12 three-bedroom apartments ranging in size from 660 square feet to 1,065 square feet. Nine units will be set aside for residents earning at or below 35 percent of area median income (AMI); 68 will be for residents earning at or below 60 percent of AMI; and the remaining 13 will be market-rate units. Amenities at The Addison include a state-of-the-art fitness center, club room, locker storage, resort-style pool, dog park, playground, media center, and 600 square feet of retail space. HTG has seven other affordable housing communities in various stages of construction in Florida including Hammock Ridge Phase II in Spring Hill; Arbor View in Margate; Heron Estates in Riviera Beach; Douglas Gardens V in Pembroke Pines; Princeton Park in Miami; Freedom Gardens Phase II in Brooksville; and Twin Lakes Estates in Lakeland..